DUMBARTON and promotion hopefuls Raith Rovers fought out a 0-0 draw, but it was an exciting contest. 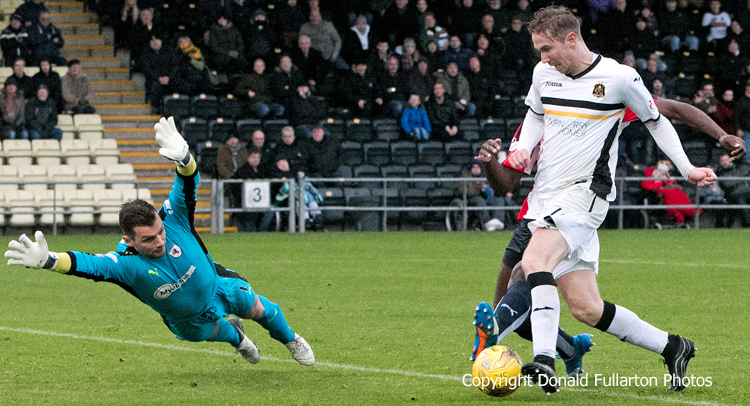 DUMBARTON and promotion hopefuls Raith Rovers fought out a 0-0 draw at the ,Cheaper Insurance Direct Stadium, but it was an exciting contest. Some 600 fans wrapped up against bitterly cold weather were warmed by the endeavour from both teams, despite the lack of goals. Sons had the better of a competitive but slightly scrappy first half, while lacking a decisive edge up front. There were half chances for Robert Thomson, Darren Barr, Sam Stanton and Donald McCallum before the break. Declan MacManus had the best opportunity for the visitors, but was defied by keeper Alan Martin. Dumbarton continued to pile on pressure after the break, with Raith confined to seeking to nick something on the counter. Rovers keeper Kevin Cuthbert made two solid stops from powerful Sons headers, while Martin had looked equally reliable at the other end when tested. As the second half progressed Dumbarton were clearly the better team overall. But the ball just would not go in for them. Darren Barr was given the Sonstrust Man of the Match award by Sonsview programme editor Graeme Robertson. The picture shows Cuthbert at full stretch to save from Robert Thomson.